Lunar Lander is a single-player arcade game in the Lunar Lander subgenre. It was developed by Atari, Inc. and released in August 1979. In the game, the player controls a lunar landing module as viewed from the side and attempts to land safely on the Moon. The player burns fuel points to rotate the module and fires a thruster to counteract gravity, earning points based on the skillfulness and difficulty of the landing. The game resets the module after every successful landing or crash with a new landing terrain and ends when the player runs out of fuel. Players can insert more coins at any time to buy more fuel, allowing for potentially indefinite gameplay. Development of the game began with the creation of a vector graphics engine by Atari after the release of the 1978 Cinematronics game Space Wars. Upon its completion, engine co-designer Howard Delman proposed using it to create a Lunar Lander game, a genre which had seen numerous text-based examples beginning in 1969 and the graphical game Moonlander (1973). Delman and Rich Moore then developed the game itself. It was Atari's first vector-based game and the first multiple-perspective video game, changing views as the module approaches the Moon. Lunar Lander sold 4,830 units, a moderate success, but it was soon overtaken by the November 1979 Asteroids, and 300 Asteroids units were shipped in Lunar Landing-branded cabinets. Lunar Lander was one of the first two games to be registered with the United States Copyright Office, though the prior games in the genre kept the gameplay from being patented. It was one of the first games ported by Atari to its Atari Arcade browser game portal and has been featured in an art installation at the Dublin Science Gallery. Lunar Lander is a single-player game in the Lunar Lander subgenre in which the player attempts to land a lunar landing module on the Moon. The game is displayed using black and white vector graphics and depicts a side-on view of the terrain and the landing module. At the top of the screen, the player is given information on the module's speed, altitude, and fuel, along with the score and time spent in the game. The terrain is very jagged and has only a few flat areas appropriate for landing. The player controls the orientation of the module and fires the thruster in order to steer the module to a landing area and land safely. The module is always displayed in the center of the screen, with the terrain scrolling beneath it as it travels horizontally, wrapping the single screen-width of terrain endlessly. If the player successfully lands the module, they are awarded points based on how softly the module landed and the difficulty of the landing site and are awarded a small amount of fuel for good landings. The safe landing areas are highlighted with a flashing bonus multiplier, which is higher for smaller areas. If the module crashes—which happens if it is moving too fast or rotated too far from vertical when it touches the ground, or if the landing area is not flat—then a small amount of points is awarded. When the lander gets close to the surface, the view changes to a close-up view of the lander. The player has a limited amount of fuel, which is consumed by controlling the module. Whether the player lands safely or crashes, the game starts another round with a different set of terrain and the player's remaining fuel. The game ends when the module touches the ground after running out of fuel. The game is controlled via two buttons that rotate the module left and right, a large handle that fires the thruster proportionally to how hard it is pulled, and an "abort" button that rotates the module back to vertical and fires the thruster, burning a large amount of fuel in an attempt to stop the module from crashing. Each action uses fuel, and when the fuel runs out the module no longer responds to the controls. The game features four levels of difficulty, which adjust the landing areas and module controls. The highest difficulty causes the module to continue rotating after it is turned until the player counters the rotation instead of only turning while the button is pressed. The player can adjust the game's difficulty at any time during play. 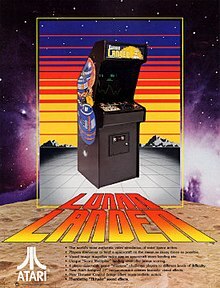 Unlike other arcade games, Lunar Lander does not feature a time limit; instead, the game starts with a set amount of fuel and inserting additional quarters purchases more fuel, allowing indefinite gameplay. The amount of fuel gained per coin, including the initial game starting-coin, is adjustable by the operator to set levels ranging from 450 units to 5400 units. The Lunar Lander concept was initially created in 1969 as a text-based game called Lunar, or alternately the Lunar Landing Game. Many further versions of the game were developed over the course of the next decade; by 1979 the style of game was collectively seen as its own subgenre. The first graphical version of the subgenre, Moonlander, was released in 1973 by DEC, which commissioned a real-time, graphical Lunar Lander game to demonstrate the capabilities of its new DEC GT40 graphics terminals. After the release of the 1977 Cinematronics vector graphics game Space Wars, Atari began work on their own vector graphics engine, in which the graphics are constructed by drawn lines instead of pixels like in the more standard raster graphics engines. The initial hardware design work was done by Cyan Engineering, Atari's research and development subsidiary. Once it built an initial hardware concept, the project was passed on to Atari employee Howard Delman, who enhanced the prototype engine into one that could be used by game designers. Once it was done, he proposed using the monochrome game engine for a Lunar Lander game. Delman had previously played Moonlander during a tour of NASA and had played one of the text-based Lunar Lander games in college. In Fall 1978 development of the game began, with Delman in charge of the hardware and Rich Moore, who had only been with Atari for a few months and who had also played a Lunar Lander game in college, focusing on the programming. Development began with Moore drawing out the game's graphics on graph paper, after which the pair wrote out the game's code on paper for typists to transcribe. Delman and Moore worked closely together, bouncing ideas off each other as Moore proposed programming designs and Delman iterated the hardware design. One point of contention in the development process was the difficulty of the game; Delman initially wanted the module to move as realistically as possible, but they determined that the result was almost impossible to play. As Delman noted in an interview in 2010, "even the real lunar landers had computer assist!" Eventually, they settled on including four difficulty levels, as compared to Moonlander's three, though Delman has referred to the hardest level as "one of the most painful difficulty spikes in gaming". Delman chose the large handle used to control the thruster: Atari initially planned to use a standard joystick, but he wanted a control with more physicality, including adding a rubber pad at the bottom to give players the impression that they could pull harder for a little more thrust. The thrust control has ten levels of thrust, as compared to the single on or off level of thrust in previous Lunar Landers, though Moore has noted that this gives players more incorrect options to choose from. The game's font was designed by Ed Logg and used for several other Atari vector graphics games. Several planned ideas had to be cut from the game during development. Delman has stated that chief among these was retaining a crater where the player's previous spaceships had crashed; it was cut as the new hardware could not draw enough lines fast enough to handle the detail. He also wanted to add in a McDonald's location easter egg, as was present in Moonlander. Over a year after development started, Lunar Lander was released in August 1979, just after the tenth anniversary of the first manned Moon landing, though Atari did not link this connection in its marketing of the game. Lunar Lander proved moderately commercially successful, selling 4,830 cabinets. Cash Box noted in September 1979 that the machines were very popular with customers. It was Atari's first vector graphics game and the first multiple-perspective video game with the inclusion of the up-close view of the lander. Atari developed a two-player version of the game, but only two prototypes were ever made as it did not enter production. The two-player version was cancelled as Lunar Lander's popularity was soon overtaken by Atari's Asteroids (November 1979), which used the same vector graphics engine and which had initially been based on Lunar Lander's code. Atari ceased production early on Lunar Lander in favor of shipping Asteroids games in Lunar Lander cabinets; the first 300 Asteroids games were released with Lunar Lander artwork on the side. The Atari Lunar Lander was the most popular version to date of the "Lunar Lander" concept, surpassing the prior Moonlander and text-based games, and most later versions of the concept are implicitly or explicitly based on the Atari version. In 1977, Atari produced Star Ship for the Atari 2600, which contained several space-related games; one of these was titled Lunar Lander, though despite the name its gameplay involved landing on a surface while avoiding enemy spaceships instead of the gameplay of the arcade game. While Atari did not produce any true sequels or contemporary ports of the game, in 1981 Adventure International produced a version of the concept under the title Lunar Lander as part of a series of arcade game clones for the TRS-80 and Atari 8-bit computers, which, though featuring differences from the Atari version, was advertised as "an arcade game simulation". At least one other arcade game based on the Lunar Lander concept was developed around the same time, the non-vector graphics game Lunar Rescue by Taito. The Atari Lunar Lander has been included in several Atari compilation releases for various platforms starting in 2003, such as Atari: 80 Classic Games in One (2003, personal computer), the Atari Flashback 2 console (2005), Millipede / Super Breakout / Lunar Lander (2005, Game Boy Advance), Retro Atari Classics (2005, Nintendo DS), Atari Masterpieces (2005, N-Gage), Atari Classics Evolved (2007, PlayStation Portable), Atari Greatest Hits (2010, Nintendo DS, Android, iOS), and Atari Flashback Classics Volume 1 (2017, PlayStation 4, Xbox One). In 1980, Asteroids and Lunar Lander became the first two games to be registered in the United States Copyright Office, though Burness has claimed that Atari also attempted to patent the game design, which was rejected due to his prior Moonlander. In 2012, for the 40th anniversary of Atari's founding, it released a set of its early games as browser-based games as the "Atari Arcade"; Lunar Lander was one of the initial set of eight games. That same year, Lumen Prize-winner Seb Lee-Delisle presented his "Lunar Trails" art installation at the Science Gallery in Dublin, in which a machine draws out the cumulative paths taken by players of a Lunar Lander arcade game. ^ a b Lunar Lander Operation, Maintenance and Service Service Manual (PDF). Atari, Inc. August 1979. Archived (PDF) from the original on 2017-06-28. ^ a b c d e f g Edwards, Benj (2009-07-19). "Forty Years of Lunar Lander". Technologizer. Archived from the original on 2016-01-16. Retrieved 2016-02-18. ^ "Graphics Games for Exidy Sorcerer". Intelligent Machines Journal. No. 4. 1979-02-28. p. 3. ISSN 0199-6649. ^ Bisson, Gigi (March 1986). "Game of the Month: Lunar Lander Construction Set". Antic. Vol. 4 no. 11. ISSN 0113-1141. ^ a b c d e f g h i "Lunar Lander". Retro Gamer. No. 79. Imagine Publishing. July 2010. pp. 40–43. ISSN 1742-3155. ^ "California Clippings" (PDF). Cash Box. 1979-09-15. p. 62. ISSN 0008-7289. ^ The A-Z of Atari 2600 Games, § "Star Ship"
^ "Lunar Lander" (PDF). Adventure International Microcomputer Software Catalog. Vol. 3 no. 2. Adventure International. 1983. p. 12. ^ Humphries, Scott (2004-01-27). "Atari: 80 Classic Games in One Review". IGN. Ziff Davis. Retrieved 2018-08-28. ^ Atari 2600 Manual: Atari Flashback 2 Owner's Manual. Atari, SA. 2005. Retrieved 2018-08-28. ^ Provo, Frank (2005-09-20). "Millipede / Super Breakout / Lunar Lander Review". Gamespot. CBS Interactive. Retrieved 2018-08-28. ^ "Retro Atari Classics" (in French). JeuxVideo.com. 2005-03-16. Retrieved 2018-08-28. ^ "Atari Masterpieces Vol. 1" (in French). JeuxVideo.com. 2005-10-25. Retrieved 2018-08-28. ^ "GC 2007 : Atari annonce Atari Classics Evolved" (in French). JeuxVideo.com. 2007-08-21. Retrieved 2018-08-28. ^ Harris, Craig (2010-08-10). "Atari Greatest Hits Volume 1 Review". IGN. Ziff Davis. Retrieved 2018-08-28. ^ Parish, Joseph (2011-11-07). "Atari's Greatest Hits now available for Android". The Verge. Vox. Retrieved 2018-08-28. ^ "Atari Flashback Classics Volume 1" (in French). JeuxVideo.com. 2017-02-24. Retrieved 2018-08-28. ^ Lardinois, Frederic (2012-08-30). "Lunar Lander In HTML5: Atari Teams Up With Microsoft To Bring 8 Classic Games To The Browser". TechCrunch. AOL. Archived from the original on 2017-07-05. Retrieved 2017-11-20. ^ VanHemert, Kyle (2012-12-03). "Infographic: An Arcade Classic, Charted In Real Time". FastCo.Design. Fast Company. Archived from the original on 2016-08-25. Retrieved 2017-11-21. Eddy, Brian R. (2012-07-20). Classic Video Games: The Golden Age 1971–1984. Bloomsbury Publishing. ISBN 978-0-7478-1108-4. Farrell, Joyce (2017-01-27). Programming Logic and Design, Comprehensive (9th ed.). Cengage Learning. ISBN 978-1-337-51704-1. Gardner, Drew (2004-10-26). Compton, Shanna (ed.). Gamers: Writers, Artists and Programmers on the Pleasures of Pixels. Soft Skull Press. ISBN 978-1-932360-57-8. Hawken, Kieren (2017-02-16). The A - Z of Atari 2600 Games: Volume 1. Andrews UK. ISBN 978-1-78538-635-0. Hawken, Kieren (2017-05-22). The A - Z of Atari 8-bit Games: Volume 1. Andrews UK. ISBN 978-1-78538-692-3. Tringham, Neal Roger (2014-09-10). Science Fiction Video Games. CRC Press. ISBN 978-1-4822-0388-2. This page was last edited on 8 April 2019, at 19:48 (UTC).